When you activate Cruise Mode, you can identify any maritime asset on the Live Map (as they stop being anonymized). 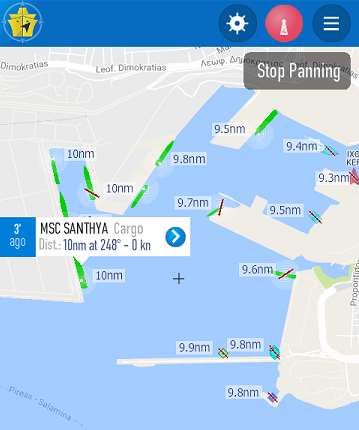 What's more, you can find more details and information in near real-time and visit the Details pages of any Vessel, Port or Light that is displayed on your screen. Tap on any asset icon to find out its name and type as well as its distance, location (in degrees) in relation to your position and its speed. You can also be notified about the last time its position was recorded by MarineTraffic. Tap on the tooltip to access the Details page of the subject asset where you can find more information about it and view photos. the Default Photo of the vessel. Tap on it to view all the available photos of the subject vessel that have been uploaded to the MarineTraffic Photo Directory (note the indication at the top right corner of the default photo - this is the total number of uploaded photos). 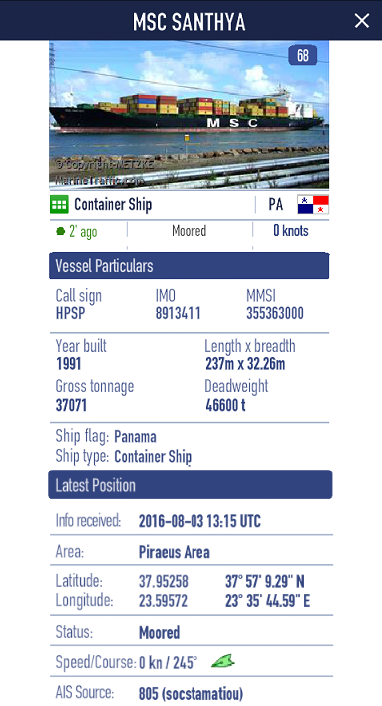 the Vessel Particulars section where you can be informed about the vessel's main static data such as IMO and MMSI numbers, dimensions and type. the Latest Position section where you can see all the details regarding the last recorded position of the vessel as picked up by any of the MarineTraffic AIS-receiving Stations. Similarly, Ports and Lights have their own Details pages where you can learn more about the respective assets and have a look at their uploaded photos. At the bottom of the Details pages, there is also a toolbar that contains shortcuts for popular actions. Tap on the LOCATION icon to view the position of the subject asset on the Live Map. Tap on the PHOTO icon to upload your own photos of maritime interest for the specific asset to MarineTraffic.